I tried water skiing once when I was about 10. I don’t think I understood the correct technique. The handle would just get pulled out of my hand each time. I just spent the afternoon bobbing up and down in the water waiting for the boat to come back around to try again. Even if hes not going fast enough to be skiing, it looks like fun to be pulled around by a tiny boat in the water. Hehe, excellent. Biff’s expressions are always great. Hey Matt, nice to see you again. Well I don’t think it’s the most extreme thing Biff has done. I’m a pretty new Reader, saw your ad on Alien Loves Predator, clicked and boy am I glad I did, Your stuff is totally brilliant. Denieru, great! I love it when people click on my ads. Chris, I’ve been reading Biff all day and leaving comments throughout, these are some of the most hilarious one-shot panels I’ve ever read! Darn it, now I remember! I was shopping for shirts on Dirty Microbe and I saw the comic’s link! Sorry to leave a double post! Thanks for spreading the word Roy_vf1s! I found an ad on Blastwave which I had just finished reading the archive of, all of them are really great and your site is now my homepage and I have one panel set as my background…I may cycle them as I feel I want to. Hey Skips, that’s cool. I don’t even have a Biff desktop. Perhaps I should make some official ones. Yeah, it would be great if you did, but the simplicity of the single frame lends what you already have to an easy desktop…it was pretty disturbing before I took it off tile though and had Biff all over the place, now its just a little disturbing. Hahaha, what image were you using? Heh.. I saw your ad on bob and george. 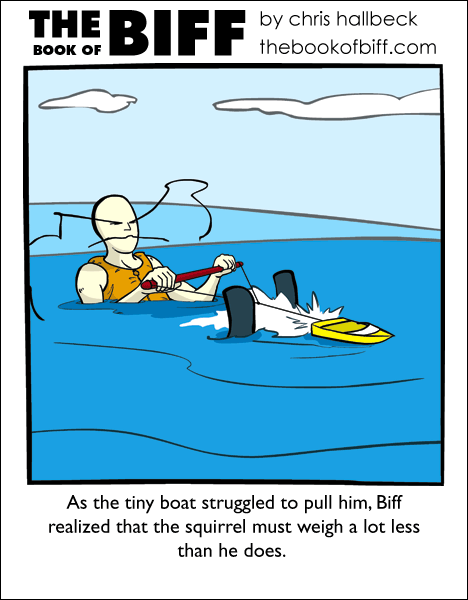 To have a squirrel you must first draw the squirrel,or if the squirrel is the boat it must be shaped like a squirrel. Actually I cant remember…my current one is the Clown one. Wow this site is getting popular! Nice reference Chris.. I still remember the first time I saw the parrot in the RC boat on AFHV, did ya see that one? hehe. The Squirrel is the ultimate classic though.. those crazy squirrels..
Ha, I still watch that show, although it would be better if they just showed the clips and cut out all the in between stuff. Is this squirrel one of the city rodents Biff annoys? it must… NO ONE SUSPECTS YOUR RANDOMNESS! But Biff wouldn’t think of that. I think we’ve all seen the squirrel photo. anyway, the boat started and of course, the board whips out from under me because i was doing it wrong. And i forgot to let go of the rope! I dragged along for like 20 feet. my uncle said i looked like a torpedo.